Tarot & Oracle Card Reading is a process whereby a Reader will employ a deck of cards as a divinity tool to perform a reading for a Seeker. The Seeker may explore areas of life e.g. relationships, career, family, health, personal growth, spiritual path, wealth issue, immediate future for clarity, wisdom and truths to progress on own path. Of late, interest in various card readings has grown tremendously around the world especially for divinatory purposes. More and more people are searching ways to blend inner and outer beauty so they can lead their lives more whole-heartedly. They have discovered in card reading as a powerful tool for personal development, insights and guided directions. 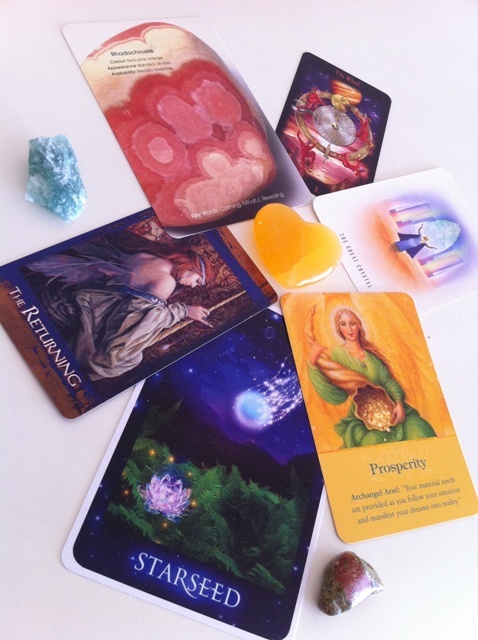 As an intuitive Reader, Tristen understands that the integrity and authenticity of a reading is very crucial to empower YOU in overall well-being! Thus, Tristen works with his and your Higher Guides to give you prospects and alternatives to enhance the beauty of your desired life. Please follow your heart to engage in this service by sending an email via sessions@tristenchurn.com to book your Skype session. Skype session is available from Monday - Friday, 10:00 a.m. to 8:00 p.m, Malaysia Time. After booking your time slot, please make your payment via the following PayPal button. We will send a confirmation of appointment to you once we received the payment. "The channeling session with Tristen is an eye opener. I would say I am very impressed with the messages channeled. I feel much more secure and certain in the direction I am heading now. I found guidance and solutions to the issue that has been bugging my mind for years. At least I see light at the end of the tunnel now. I must say thank you to Tristen for his patience and wit to make the entire session so relax and comfortable." "I find Tristen's reading and channelling very comprehensive and detailed. My mind is clearer and I become more focus after the session. Most importantly the accuracy and messages channelled were astounding. I was even guided to start on a meditation which has reduce my stress and calm my mind progressively. I would definitely recommend my circle of friends who are interested in this art to meet this wonderful guy"
"I can hardly find words to describe the accuracy in your tarot reading. From the doubts in beginning until it has came true one by one eventually. It’s amazing. Additionally, I would really like to thank you for your spiritual guidance." "Tristen's tarot reading has guided me through an incredible journey of realising what's ahead waiting for me to achieve......"
It's almost 8 years since I first know Tristen. Both of us just can't believe that time had passed that fast. Few days back, I received an email from Tristen, asking to help him write a testimonial for his Tarot reading service that he provides. I felt honour, and yet worried at the same time. It's hard to evaluate precisely, a friend that you had known for years, without misleading the others, who will read what you wrote. Life is always full of up and down, as well as surprises. So does mine. I consider myself lucky as I have few friends that I could talk to and share with, and Tristen happens to be one of them. What I would say is, he knows me well. He always able to clear up the doubt in my head, and let me see the way I should head to myself. It was about 2 years ago, when I met him for some advice regarding my work. It's that time I first experienced his Tarot reading. My only reaction was just simply, WOW! Not being superstitious, but he really has the talent in this card reading. I could not tell how he able to tell so many things by just reading the cards I chose. I have to admit, he is gifted in this. The last week before 2007 was over; I ended up an almost 7-years relationship. A relationship that many friends had told me that I should stop. I just refused to hear the truth, until the day I finally made up my mind. It was a hard time for me, to face the truth that I had ignored for years, and to move on alone in my life. Thanks to my friends, who are always supportive and understanding, that walked with me along this healing process. I read a lot ever since the broke off, to find a way to heal, and to find the answer of the pain I felt. You could never imagine my expression when Tristen would tell me which book to read first, before I could tell him that I bought few books from bookstore. It always turned out that he was right about it, after I read the book he recommended me to start with. Day after day, as time passed by, I came to realise that there are many things in life that we would be able to see the truth in it, only if we are willing to open up our mind, put aside our pride and be honest to ourselves, and accept who we are. According to Tristen, this is the inner-self growth. I guess this is the indirect influence that he had affected me with. Everyone that we met along the journey of life would somehow imprint certain effect in us. It depends on how well we could see the experience imprinted. If you are one of Tristen's friends, you would agree with what I mentioned, when you already knew him for some time. If you are just about to meet him, Congratulations! You are about to meet someone that would somehow change your mind in certain way, to let you see life in different perspective. I hope you would have a good experience with what Tristen is about to share with you, from the Tarot cards that you are going to choose or getting any other service that he is providing now. Remember, just be honest to yourself. Good luck.